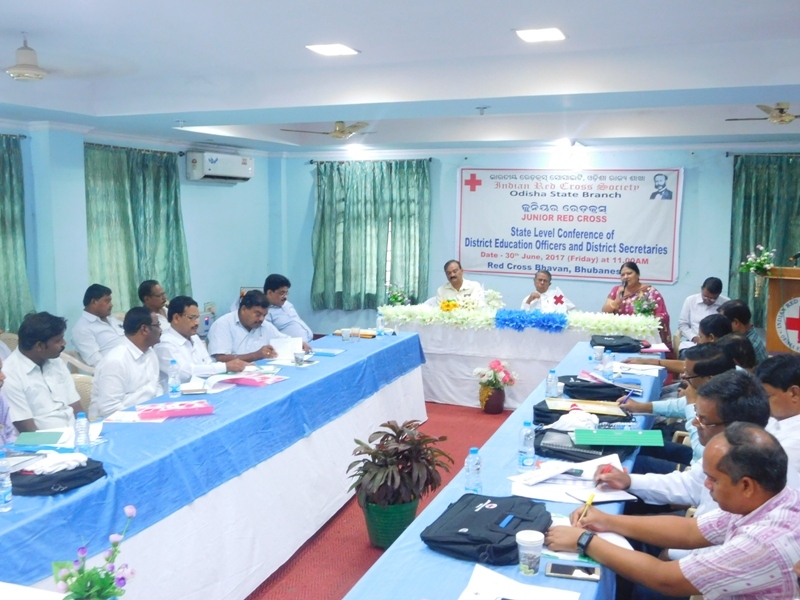 The State Level Conference of District Education Officers and District Secretaries for the Year 2017-18 was held at Red Cross Bhavan on 30th June, 2017 at 11.00 A.M. Sj. Badri Naraya Patra, Hon’ble Minister, School & Mass Education, Science & Technology, Govt. of Odisha & Chairman, JRC Working Committee, Dr. Gyanabrata Mohanty, Secretary, Junior Red Cross and Major (Dr.) Kalpana Das, Junior Red Cross Officer (I/C) inaugurated the meeting by lighting the lamp and offered floral Tribute to the portrait of Sir Jean Henry Dunant, the Founder of Red Cross movement. Other members were also present. The Hon’ble Minister, School & Mass Education, Science & Technology, Govt. of Odisha & Chairman, JRC Working Committee, other dignitaries along with the participants of the conference pledged the oath to implement the JRC motto i.e. “Health, Service & Friendship” At the outset Dr. Gyanabrata Mohanty, Secretary, JRC extended a warm welcome to the members present on the occasion and subsequently placed the Annual Action Plan for the year 2017-18 before the Committee for consideration and finalisation of venue & date for each activity. Sri Ranjan Kumar Mohanty made a power point presentation on JRC Annual activities for the year 2016-17 and planned activities for 2017-18 for the information of all District Education Officers and District Secretaries. After threadbare discussion on the subject, three stages programme at School, District and State Level was finalized.The members expressed satisfaction on the activities of the State Branch, which was highly appreciated. The meeting ended with a formal vote of thanks by Major (Dr.) Kalpana Das, Junior Red Cross Officer, Indian Red Cross Society, Odisha State Branch, Bhubaneswar.